Life is short, sometimes, and sometimes the spur-of-the-moment decisions we had to make turns out to be the best days of our life. I was thinking, overthinking about stuff in general the way I usually do, and suddenly a shudder of horror ran down my spine to think that maybe one day, soon, we will forget each other, the way we felt, buoyant, bubbly, reduced to a whisper of non-existency. It was because of a vacation-fling or slightly more than that, that I found myself in Malaysia for those 2 weeks. I had only planned to stay for a few days, as all such stories go, but we constantly surprise even ourselves, and for the most part, exploring the sleepy old town on my own, alone. And I have never felt so belonged, nor so much at peace. Stroke by stroke, those idyllic memories of the impulsive decision I made to travel with a stranger, stroke by stroke they were etched into a driftwood that had been traveling, probably floating around the strangest parts of the world, before it came ashore. And for years more, that piece of wood was untouched, until some bored girl decided to paint it in shades of blue and sea-green. There was a second hand bookstore manned by a mongrel dog and two elderly men; they were surprised at my seeming courage to travel alone, and wondered where I was from. No one could ever guess, actually, not even my own countrymen could place me as a citizen, born and bred in the tiny red dot. I smiled and asked them, part out of boredom, partly out of some subconcious interest, where would I be able to learn some artistry? For in that old town, still exists many craftsmen. In the roads where I walked, they would start their workmanship in the early hours of dawn. I was intrigued by the silversmiths, buying a little ring that cost me nothing but could pass off for something really dear; the people that made the funeral paper figures - how does it feel to spend your time crafting something that would just be burnt eventually - the men who crafted rattan lanterns, the elderly men who made all sorts of stainless steel implements, I saw them daily and a part of me inherently loved the fact that they existed. In my modern city, they would not have a place to live. I was pointed to a house-like cafe where known artists in the area went. And I was given, kindly, generously, a box of oil paints and a long piece of driftwood. Paint what's on your mind, your memories, as if I could etch them on the sands of time. I had imagined, perhaps later, much later, the person I had shared those memories with could see them, and feel a warmth radiating from his heart. But time is cruel. Time may tear us apart, or else, my morose thoughts may put an end to what is lovely, too much earlier. I guess it's safe to say both of us did not intend to have anything more than those few days, the happiest days of the year for me. Because of those days, I now live happy, each day, looking for a happy moment, 'the best part of my day', and I try to capture it on my smartphone camera, or journal it down. Some days are dark, but we always have something to look forward to, hopefully! I painted words from our days, our shared moments. The title of the book I had brought along. What we both liked to drink. And eat. Simple things like that. I found myself coming to that cafe every afternoon, with the mission to complete painting that piece of wood. And when I was done, I had a canvas to paint on. It was my first time painting with oils on a canvas. There were many first times I had shared with him last year. I guess that's why I think about him constantly, but it also drives me crazy that I can think about a person with such intensity, and sometimes I wish I can just fall in love with a person that is just happy, so happy, so I will never have to worry about him. How about painting a portrait, suggested the cafe owner, an artist who specializes in fantastically intricate pencil drawings. So I did, trying to capture the look he had in his eyes, a sort of childlike playfulness, yet with a vulnerable, wistful look that told me, I'm not ever wanting a long-term relationship anymore. Day after day, I came to shape the painting, because oils melt in a way on the canvas that is so addictive...while travelers stopped for a cool mango juice or a mini burger. So, where does the story start and where does it end? One might think it all started on that one day he came to my modern-city country and when he shared something, I couldn't stop thinking about the expression on his face and wrote poignantly about it, that in that haunting look I could see the war-torn battlefield in his soul when it came to dancing with romance. Or perhaps it all started, when we sms-messaged each other and couldn't stop and after hundreds in a few days, realised that there's something to it... that should last more than one day, if this world was kind to us. I think it started when a guy named Oliver, could not take his eyes off me, and I thought that he was the one that held the key to a vivid dream I had just before meeting him that same year; but that's another story for another time. Well, here's how it ended. I wasn't able to finish the painting, so 'Mister in shades of blue and sea-green' was left without a mouth. Mouthless. I had to go back to my life, you see, and it was hard to capture the tentative smile, the one you make without teeth, when you don't really want to be in a photo, but you want to smile at the person taking the photo. We met again, and again in the next two months. Despite coming from different countries. At every meeting, I marveled at how lucky I was to see him again. But I slowly realised that perhaps he does not look upon it the same way, not with love and gratitude, but with long shadows from the darkness of his, as-yet unresolved relationship issues. I had wanted a love like this, but not in these circumstances. I brought him to this cafe. He was amazed I had been so impacted, for lack of a better word. But the painting was nowhere to be seen. It was rumored that it had been painted over by the said Uncle figure who had given the canvas to me, free, in the first place. My mouthless art piece was gone, and I felt a tinge of sadness as the only one who could remember this painting was me, in my very short-term memory. 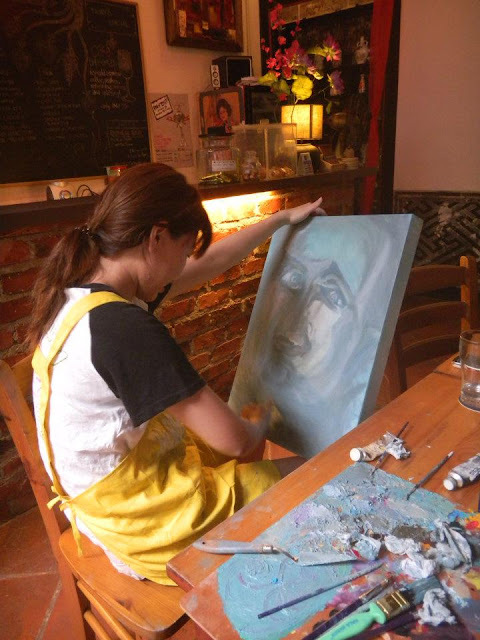 Two months later, I found a photo of me painting a blue portrait, uploaded on facebook. Gosh... one of my visiting friends actually took a photo of me, unaware. I treasure this photo, it has the power to bring me back to the exact same moment where I was painting, and thus painting, bringing me back to the moment when I was happy, very happy, the happiest days spent on vacation with him. how utterly moving this is. Such is life and its intricacy, and then you learn to untangle it, and discover its simplicity. And that's bliss.